The woman got the call and listened to the numbers being given to her. Her eyes widened, her heart sped up. She couldn’t believe her good fortune. Only a few months into the process, when last time took three years. So soon?! She was by herself, in the bathroom, away from the crowd. She hung up the phone, elated. She looked in the mirror at herself, in her pink puffy dress, her dark hair swept up into a voluminous bun, her lipsticked mouth hanging open. She went into a stall and clicked the lock. She smiled. Then she second guessed. Did the lab tech say 70? Or was it only 7? So she called back, standing inside the stall. And the lab tech giggled as she recited the joyous news for a second time. And then a third. Her husband, on his way to meet her, called the same lab tech, who got a kick out of telling the numbers for yet a fourth time. When the couple saw each other at the party, they gave each other a knowing smile, and a hug. I love you, they each said. The I love you, while true, was a private code that meant I’m so excited to start this journey with you, again. And the couple celebrated, with mocktails, two parties at once. One public, one private. A few days later, another call, from another lab tech. Not as happy, not laughing. The lab tech had a shaky voice and said things very slowly. She took forever to spit out the numbers. Hurry up! the woman wanted to say. Just say it! But instead she said, Okay. Okay. Okay. And a few days after that, another lab tech said I’m sorry. And she gave the woman the Tragic Numbers. Numbers that left her like the word looked. Sliced apart. Numb. The good news is that the woman came home to a nursery that was already full. Full of her One. She cracked the door and crept into the nursery while the One slept, so beautifully curled up, on her side. She settled into the rocking chair, with her cocktail in hand, and stared and stared and stared, filling her heart with her One’s scent, her One’s contentedness. She breathed in her One’s perfume and tried to breathe in her One’s serenity. And it worked as well as it could. He came in and saw her rocking and staring and knew she had been sitting there for a long while. He opened his mouth to ask her what she was doing, but he stopped himself. He knew. After looking at her for a bit, he turned and looked down at their One, and he bent over and rubbed his One’s back and after only a second, she awoke. She sat up, instantly covered in smiles, even though she had been disturbed from her slumber. The woman realized that deep down she’d been hoping her One would wake, and she greedily scooped her up into her arms and hugged and hugged and hugged her. Her One sleepily squeezed her right back, and their bodies encircled each other. And it felt good. Her One warmed her and relaxed her and alleviated her pain. But, her One’s great comfort also profoundly saddened her, because for while she sat in the chair enjoying her One, she knew she losing her Two. 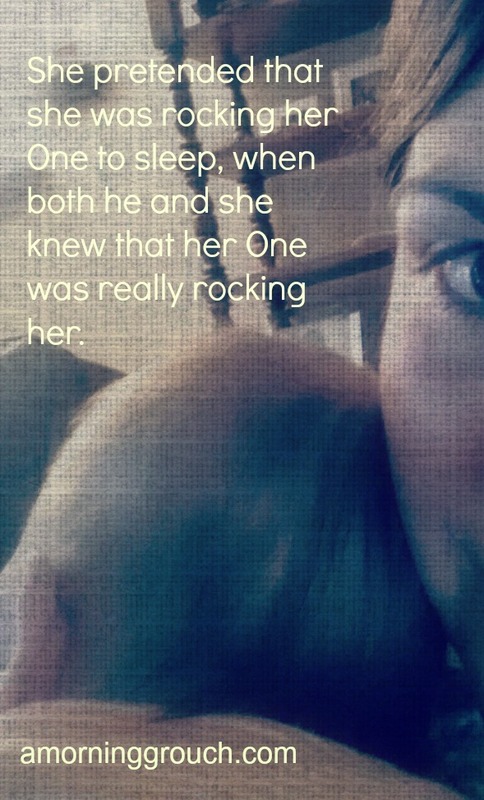 She pretended that she was rocking her One to sleep, when both he and she knew that her One was really rocking her. You get it! Thanks dear, and you’re so right about my One. This is beautiful and heartbreaking. Lost my only One through miscarriage recently; this speaks to me. And I’m sending healing thoughts to you, now. Hugs. I’m so sorry. I am sending hugs right back and hope you have your own One to cuddle soon. I’m so very sorry. So so sorry. This is so beautifully sad. I have no words except I wish you two so badly. And you love one and each other so well. Love and light to you. I am speechless. Beautiful. Heartbreaking. Hugs and love to you. I am thinking of you! What a beautiful post. Even though it is such a sad time… Hugs! Oh, yes. I know this so well. Two miscarriages before Baguette, two after, all five in four years. We all rock each other. 😦 That is a lot. Rock each other, indeed. I’m so sorry for your loss. Beautiful words express the harsh realities of life. Thank you for sharing the realness of our world. The beauty and the sadness. Hugs to you. Let me know if you need anything. I can only imagine your pain. Your description alone made me weep. I’m so glad you have this outlet and are so willing to candidly share. Even those of us that haven’t experienced your pain are taught lessons in love and appreciation through your story. Thank you. Thank you. Thanks for reading and connecting and replying. Bawling. I lost my One and my more and I don’t talk about them and I know I should but I finally got my Here One and wow. Your words. Beautiful and amazing. I still, with the Only One I will now have, as I am also now old, go in there…and relate to your words so much about how you’re rocking to sleep, when it’s ours, who are rocking us. Absolutely amazing and SO GLAD I FOUND YOU. Thanks Kristi! I’m sorry about your losses but am so glad you have your One. Some people aren’t so lucky. Still, the pain is there from the ones we lost…and like you said, SO MANY can relate to this feeling. It’s good to not be alone. Wonderfully done. That loss is so painful, so . . . much. Even though I had two children when I lost a baby to an ectopic pregnancy and then another baby to a miscarriage, it didn’t make the pain of those losses any less. I pray that your get your Two. Love and hugs. So MUCH, indeed. The immense joy that my one and your two bring us is indescribable. As is the pain/grief of a loss. Thank you for sharing..This really spoke to me. My One is definitely rocking me. For now, I am gathering my daily strength through her. Sending you lots of prayers and thoughts. thanks. right back at ya. take care of you. Wouldn’t, couldn’t allow myself to grieve too much in 1983 because (I thought) I needed to be strong for my family. Today, after re-reading this I was able to grieve just a little more. Grieving is important. It takes strength to be vulnerable, too.